A picture taken on December 3, 2012 shows a subway station in in the Paris northeastern suburban city of Bobigny. A French anti-racism association is launching a mobile application it hopes will help eradicate racist graffiti by enabling users to take photos of offensive tags, geo-locate them and get them removed. A French anti-racism association is launching a mobile application it hopes will help eradicate racist graffiti by enabling users to take photos of offensive tags, geo-locate them and get them removed. Licra—the International League against Racism and Antisemitism—said the app was a "digital response" to "a big increase in racist and antisemitic acts" in France, and would be available for download from June 11. Users who have the app will be able to take a snap of racist tags they come across with their smartphones, attach the location and send the information to Licra, which will work with local authorities to have them quickly removed. 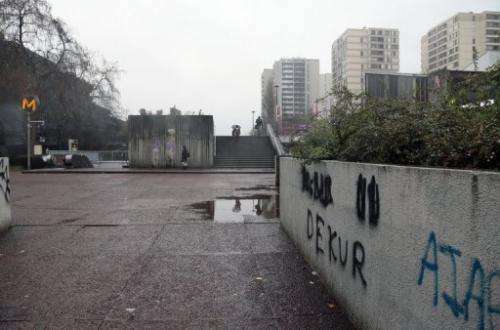 Several buildings have been defaced by racist tags in recent months in various parts of France—most of them mosques but also in one case a building housing local headquarters of the Socialist party. One mosque in Limoges in central France has been repeatedly defaced since July last year—first by racist graffiti, then by excrement, and more recently this month by red liquid that appeared to be blood.